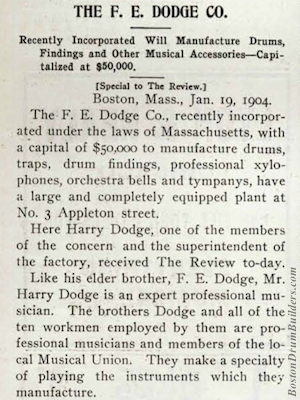 More prominently remembered today for authoring the Dodge Drum Chart (1908) and the Dodge Drum School (1909), Frank E. Dodge and his brother Harry owned and operated a well established percussion instrument manufacturing business in Boston, Massachusetts through the first decade of the 1900s. Surviving ephemera from the F. E. Dodge Company is quite scarce however. One hundred and one years after the operation was succeeded by that of Boston's Nokes & Nicolai in 1912, about all that is left of the Dodge Company is a few surviving drums, keyboard instruments, and traps. While a few tangible scraps of advertising are still floating around in the basements and attics of old New England homes, it is now easier to find mentions of the Dodge Company online thanks to the digitizing of many historical publications. Even then, traces of Dodge are few and far between. But upon running a web search for "F. E. Dodge Co." a few tidbits are brought to light. One of the most interesting finds is this small blurb from the Music Trade Review dated January 19, 1904. From this we gain a fascinating glimpse into the Dodge Company as the brief writeup describes both the amount of business in financial terms that Dodge was conducting, and the size of the workforce employed by the company at that time. Later listings in industry publications indicate that in 1907 the incorporation was legally dissolved though the business clearly continued to function for several more years. This little slip of paper recently surfaced on ebay. It is a paid check dated March 12, 1912 made out to the F. E. Dodge Company in the amount $2.50. The check was written by "F. H. Howell" of Calais, Maine, a small town at the northern most tip of New England. 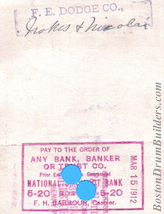 Stamps on the check indicate that it was deposited at the National Shawmut Bank in Boston on March 15th, 1912. And lest there be any doubt that this check was made out to a different "Dodge Company", the back of the check is endorsed with the names of none other than Nokes & Nicolai who were by this time in the process of transitioning into ownership of the business. So what exactly could you buy for $2.50 from the F. E. Dodge Company in 1912? Well, as a point of reference, the 1907 Dodge catalog listed drum sticks for $1.00 and untucked 18" calfskins starting at $1.15. Orchestra drums, available in both 3" x 14" and 4" x 15" sizes, sold for $12.00. Do you have an instrument made by F. E. Dodge? I want to hear from you! Send Lee and email at lee@vinson.net.